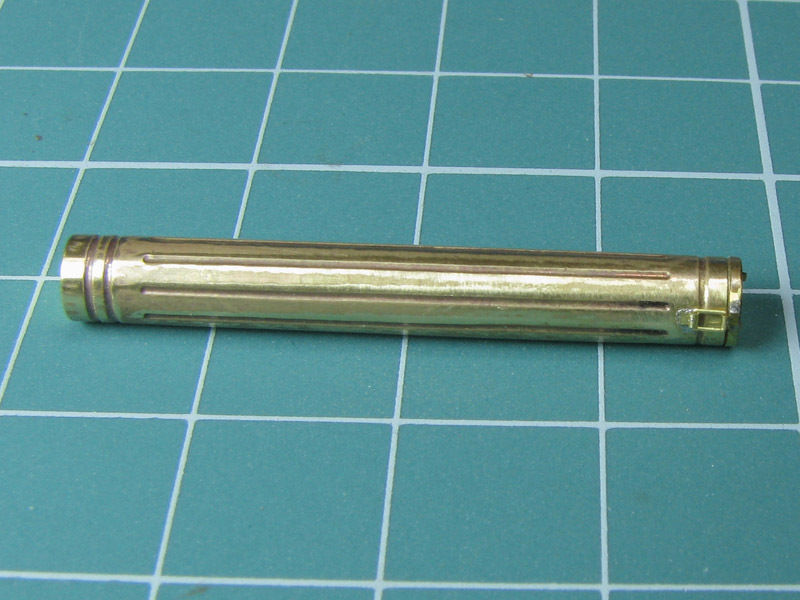 We are going to complete one metal box for 8.8 cm ammunition for Kw.K.43 tank gun. 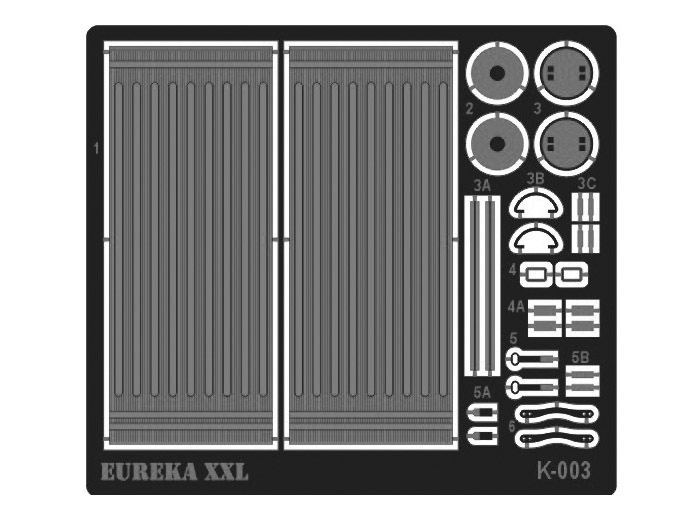 Photoetched sheet included in A-3530, A-3531, A-3532 and A-3533 sets has elements for two such boxes. Look at photo below for further reference. 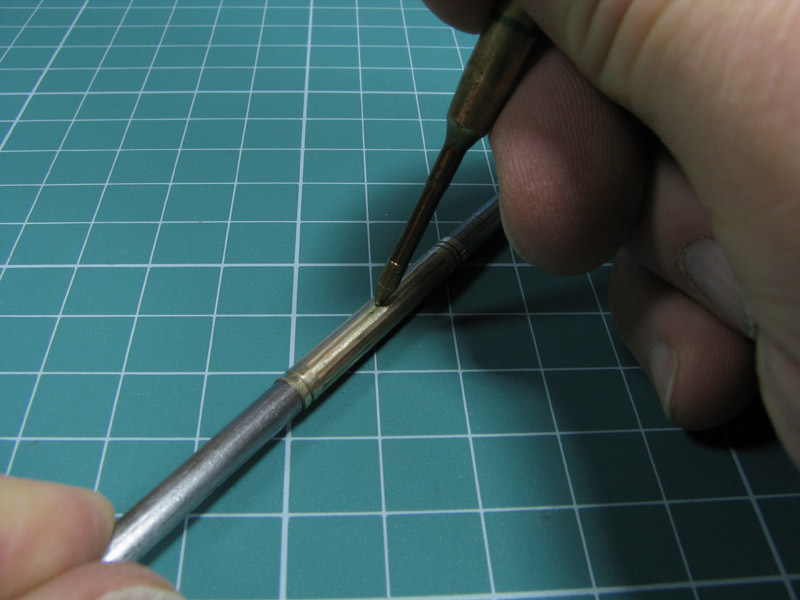 source of heat — soldering iron or gas burner. 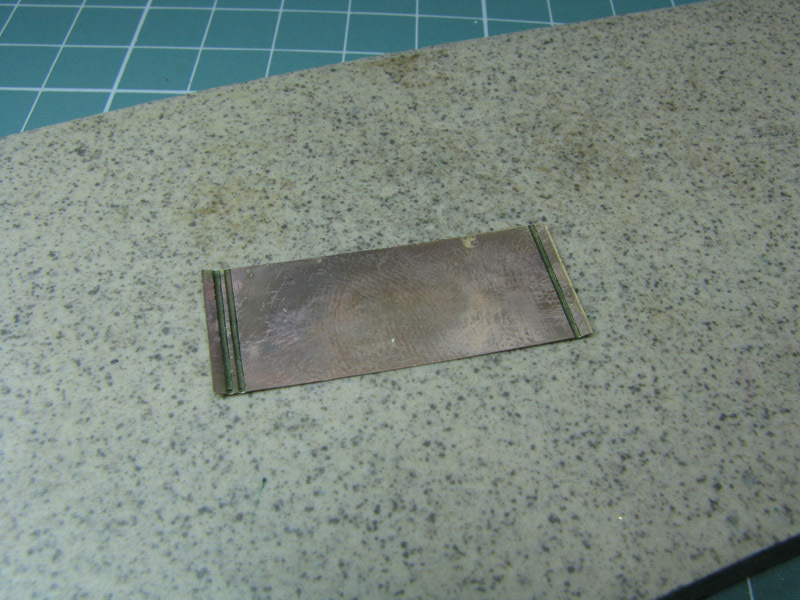 This tutorial describes methods of joining photoetched parts with use of open fire and high temperatures. 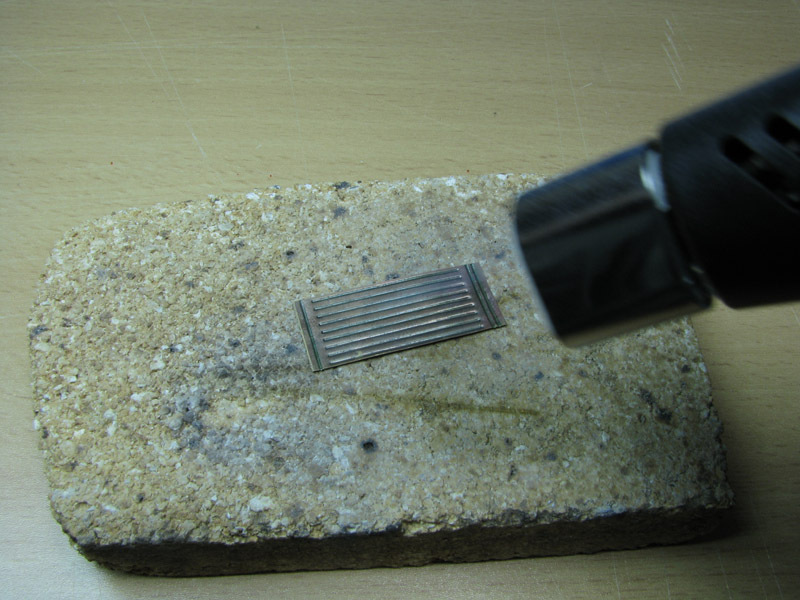 Soldering demands high temperatures so be very careful. It’s forbidden to use open fire close to the flammable items and liquids. Please remember about it, modeller’s workshop is full of flammable objects. 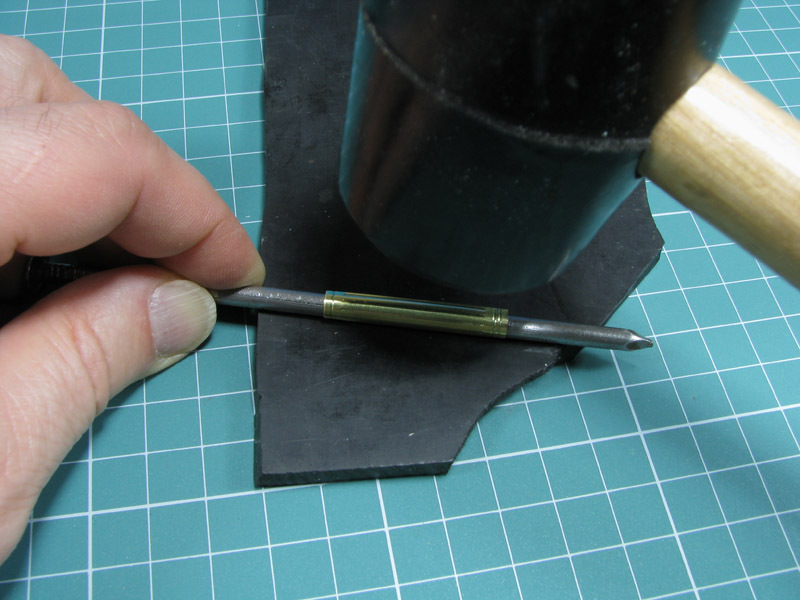 Use heat resistant table and join parts on grog pad (also known as firesand or chamotte) to avoid unnecessary risk. 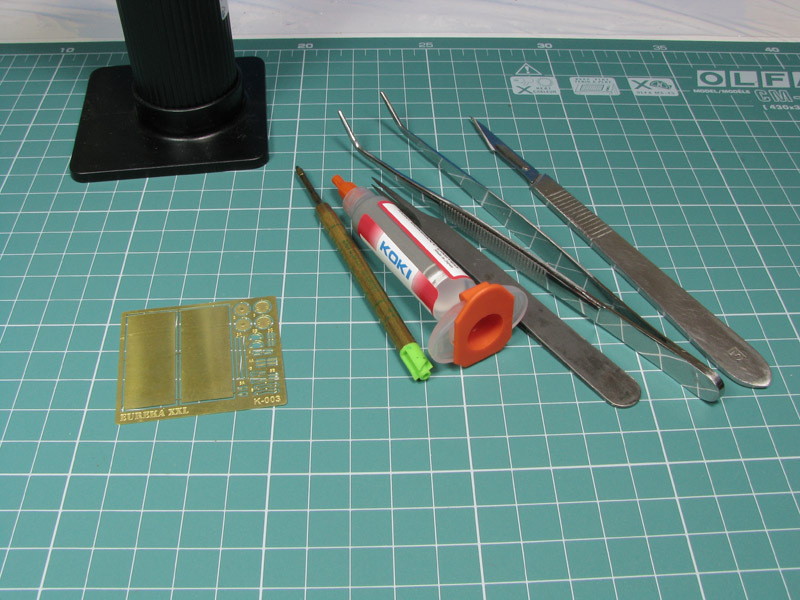 Remember to use metal forceps to keep and handle photoetched parts during soldering. 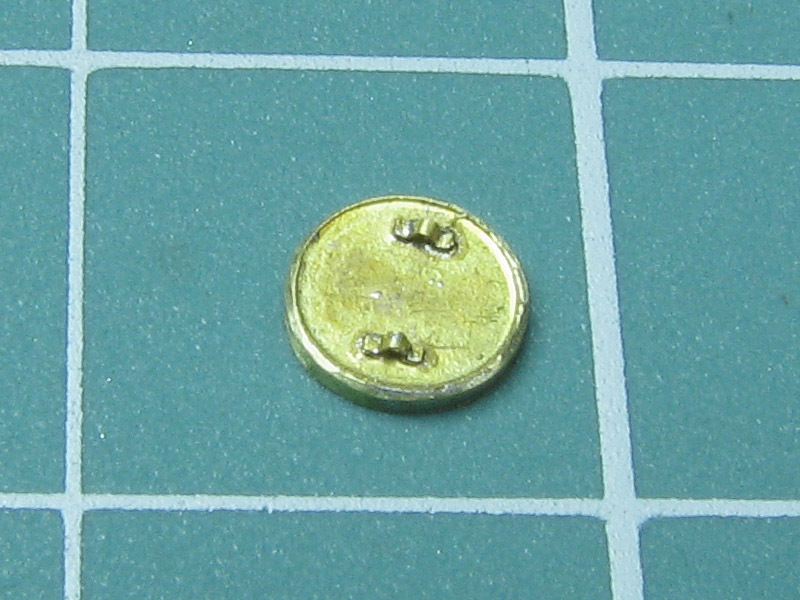 I can recommend Japanese solder paste called Koki. 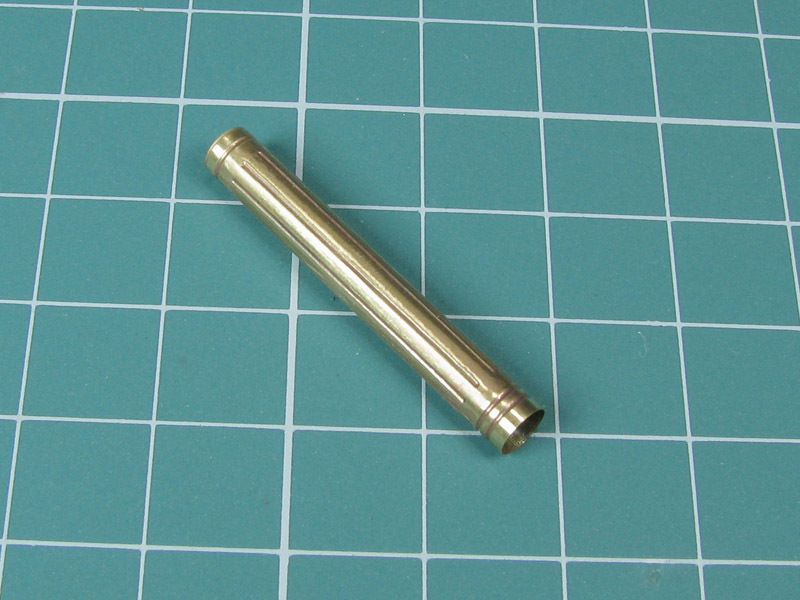 It’s excellent for fixing smaller details with use of gas burner. To join parts with use of Koki paste you’ll have to heat parts to about 200°C with use of your gas burner set on minimum power. Please be careful because gas burner can heat your photoetched parts up to 1100°C and melt them into shapeless piece of metal. 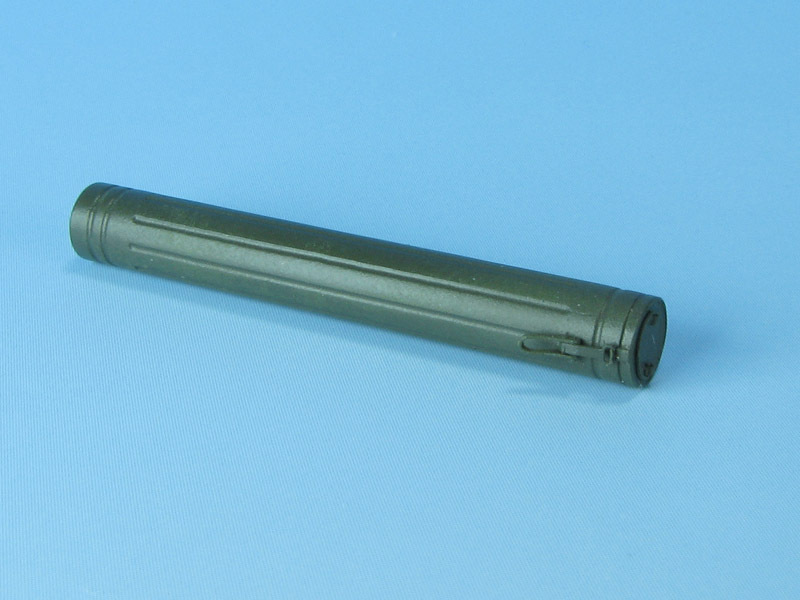 Due to pressed surface of the original metal ammo boxes we should start our job from heating whole part number 1 up to 500°C and rapid cooling by dipping it into the water. 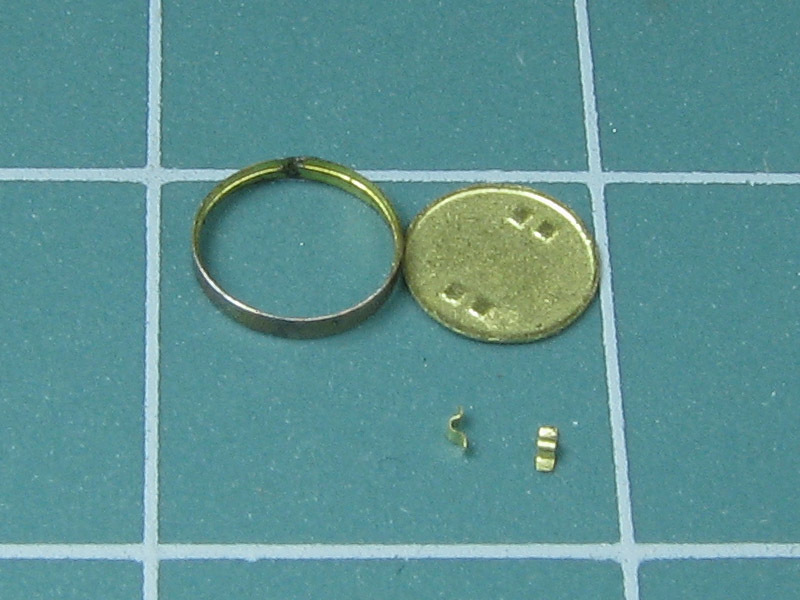 You should be careful and not overheat photoetched parts. 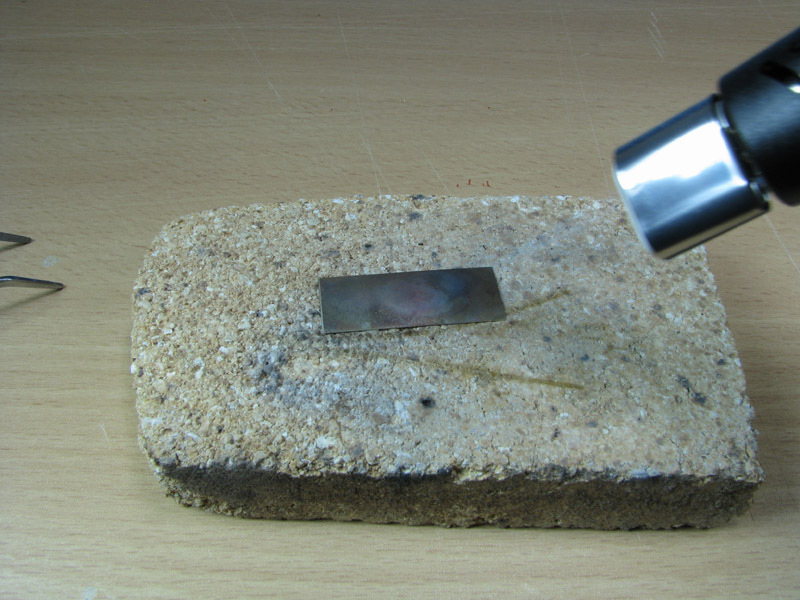 Metal heated to about 500°C changes its colour to dark red. 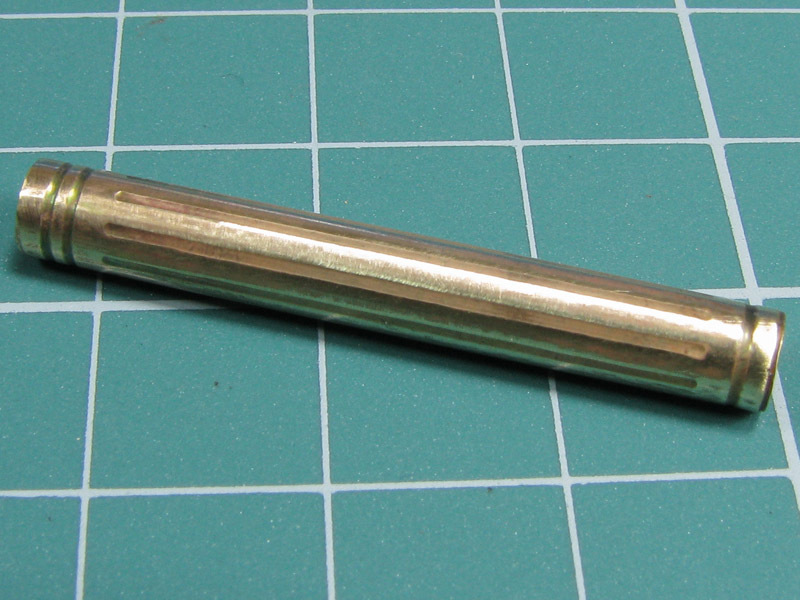 Annealed part 1 is ready to make some stamps — in designated areas — with use of the curved top of the ball pen refill. 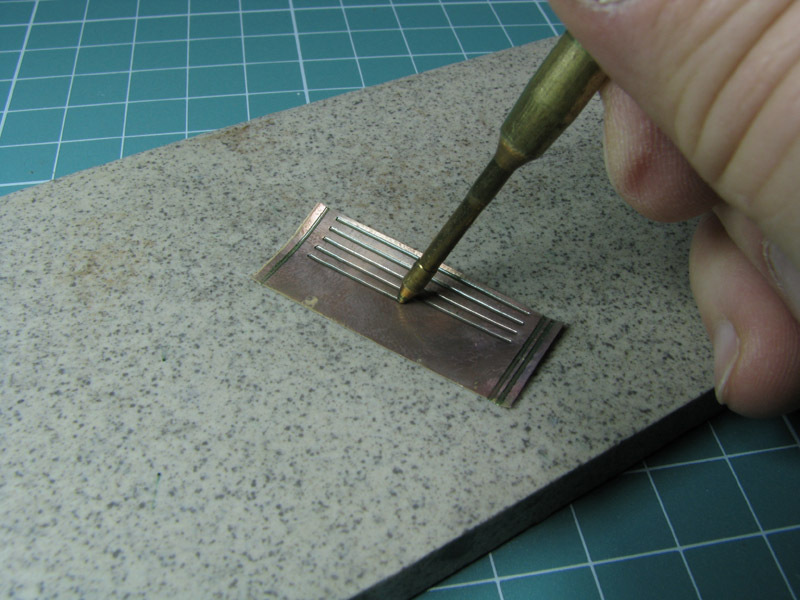 Remember to do it on flat and hard surface. 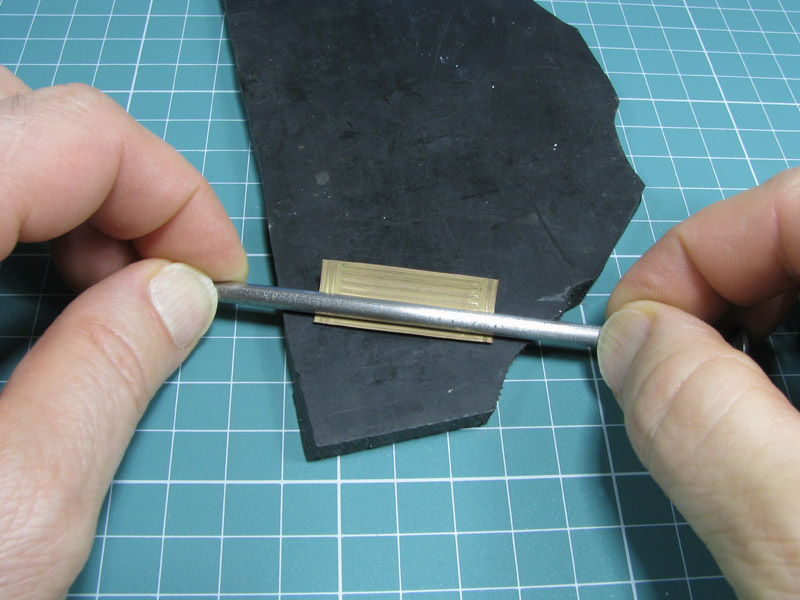 When stamping process is over, you may straighten overall shape of the element. Next move is heating it and cooling once again to get more flexible material. 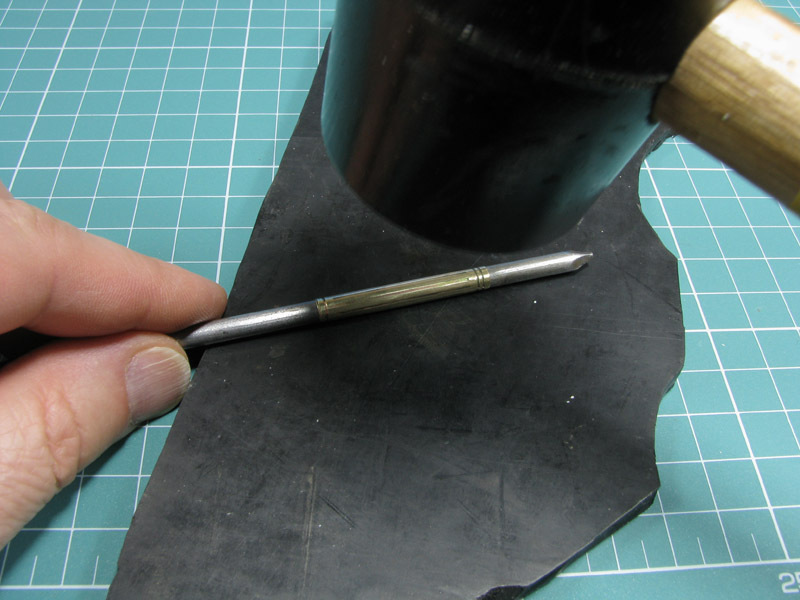 Part 1 should be formed to the tube shape by delicate knocking metal rod with use of rubber hammer. 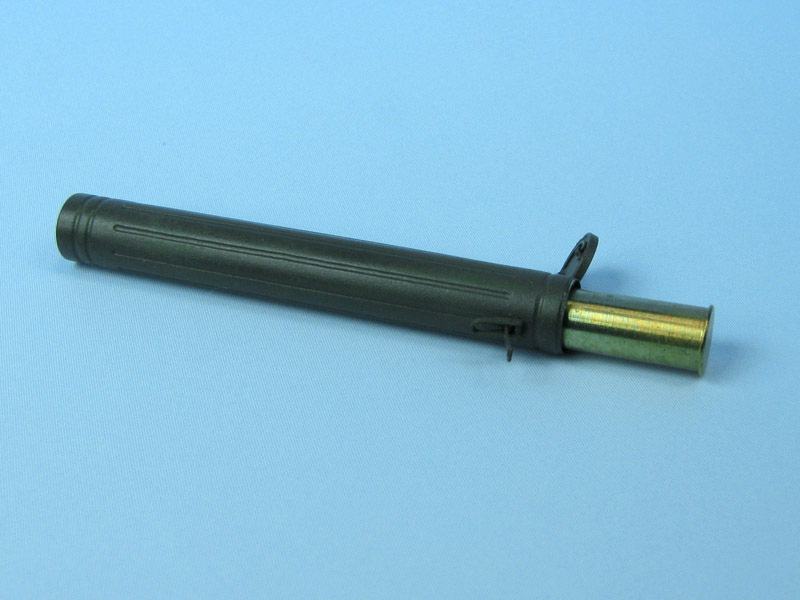 Piece of flat rubber is shock absorber and excellent surface to bend flat part into the tube. 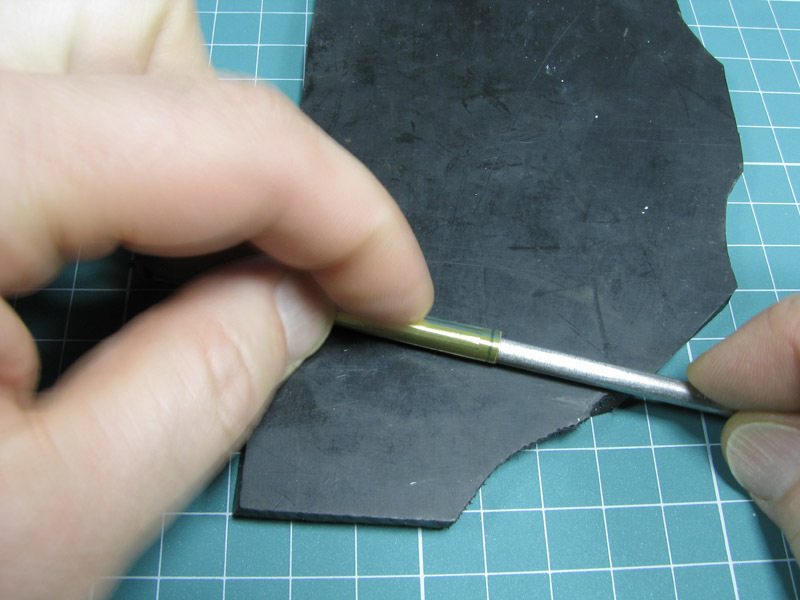 Your main goal is to precise closing both edges of the part 1 for further fixing. Such formed part 1 should be heated and colded once again. 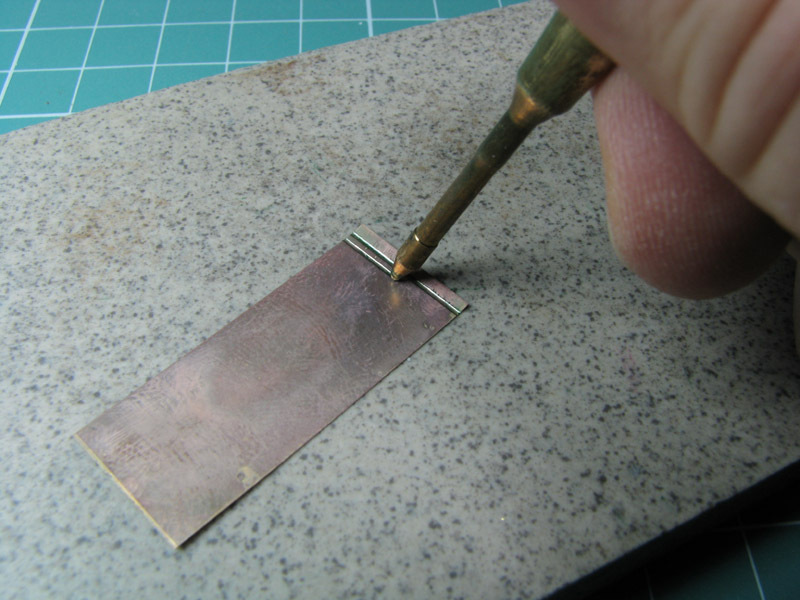 Edges should be polished with sandpaper to remove oxides. 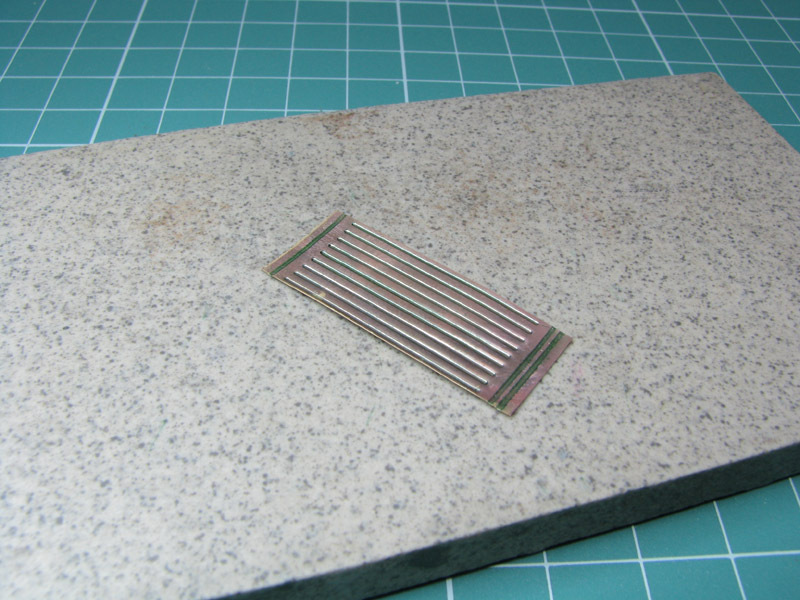 Cleaned surfaces are ready to be joined with use of traditional soldering iron. 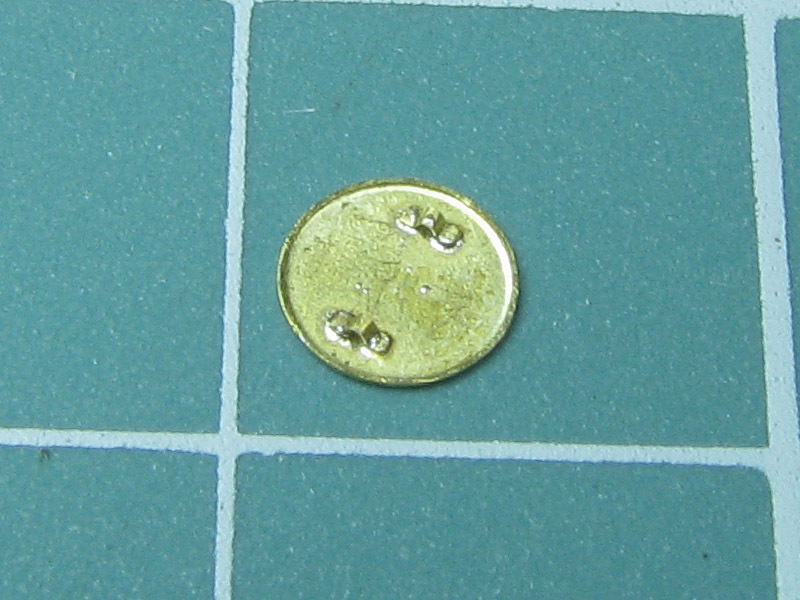 Koki solder paste is not the best choice to fix such surfaces. 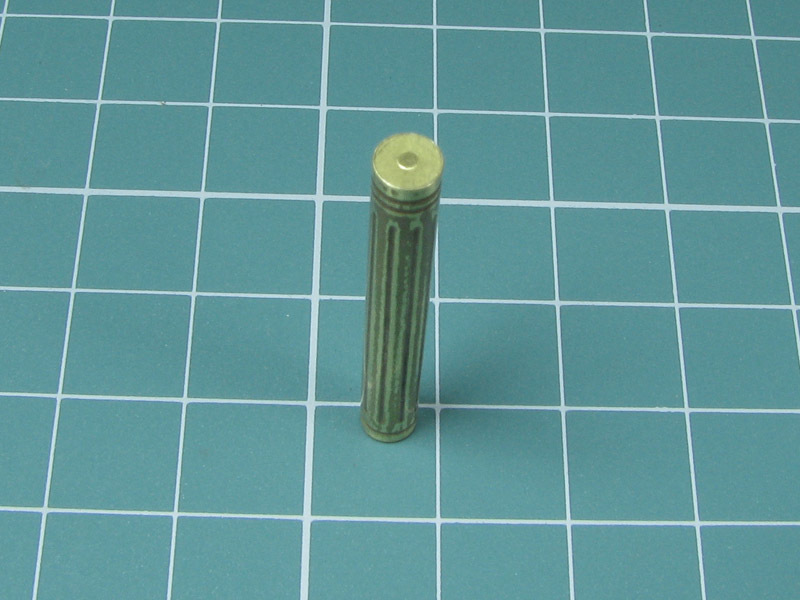 With part 1 formed into the tube we may start to make it real tube with circular cross section. 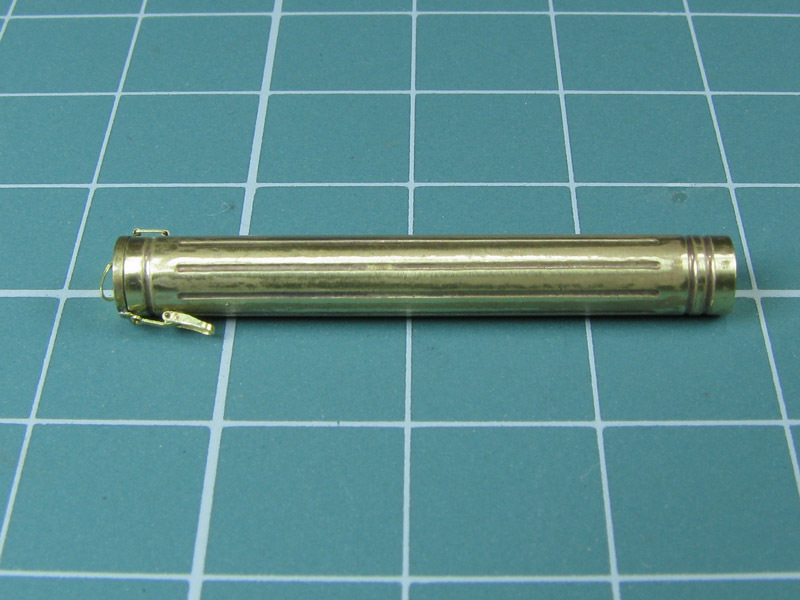 Start knocking with rubber hammer on metal rod with slightly smaller diameter (about 3.9–4.0 mm) and finish on metal rod with final 4.15-4.20 mm diameter. 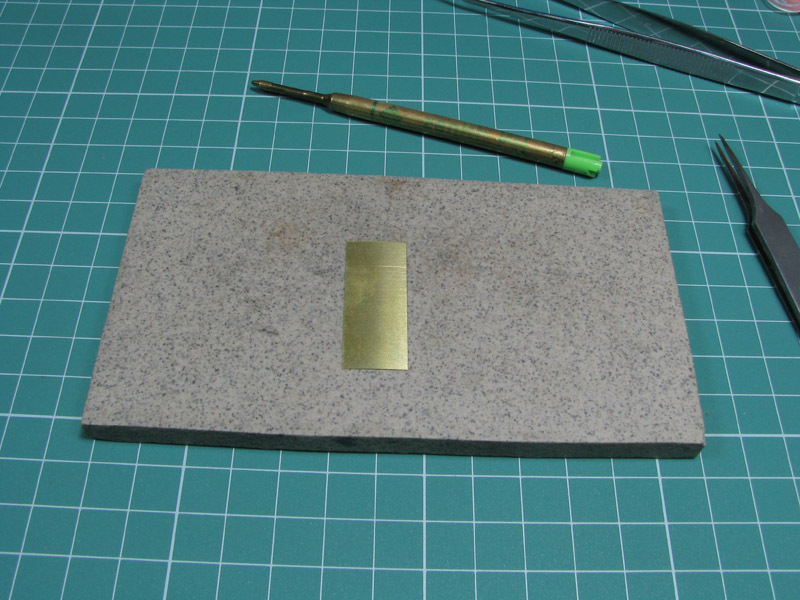 Knocking with rubber hammer will destroy stamped surface a little bit so we should to refresh it. 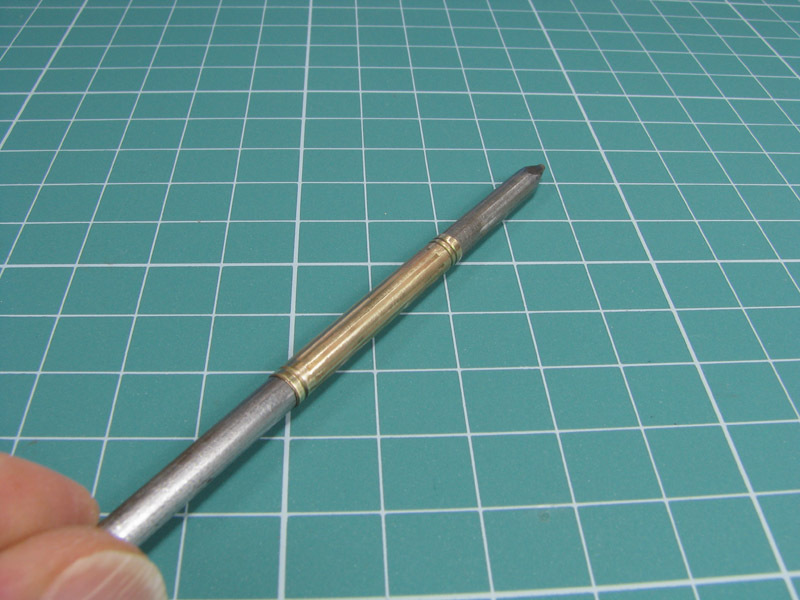 Use the same tool but this time remember to keep metal rod inside the tube. 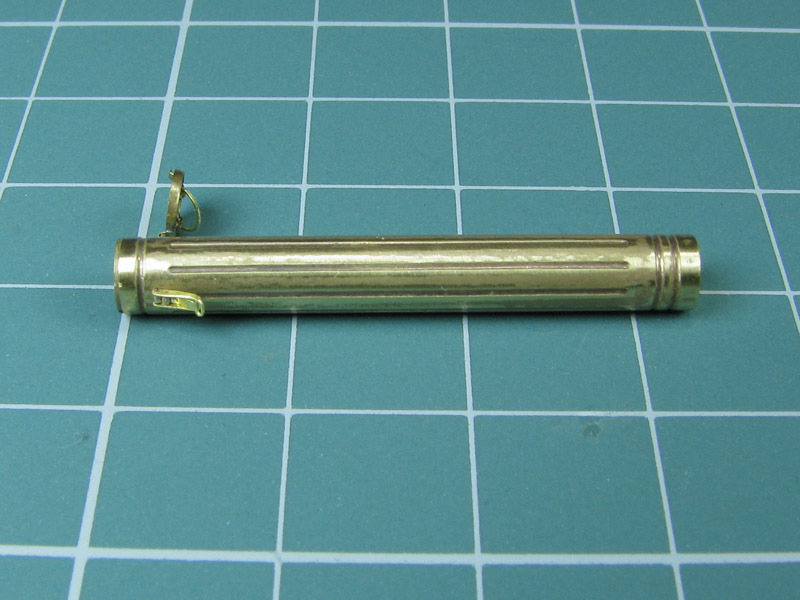 Our last job is polishing of the tube, still with metal rod inside. 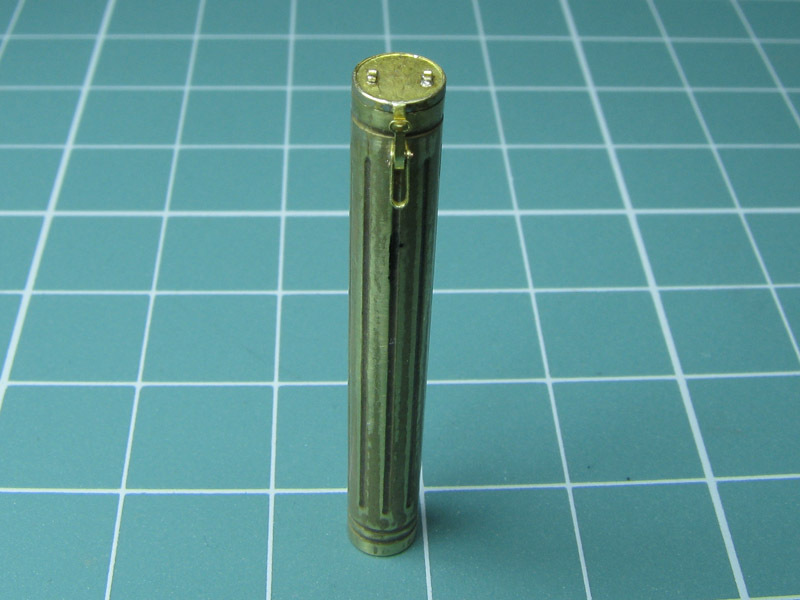 Such prepared tube can be closed with part 2 — bottom part of the metal tube. 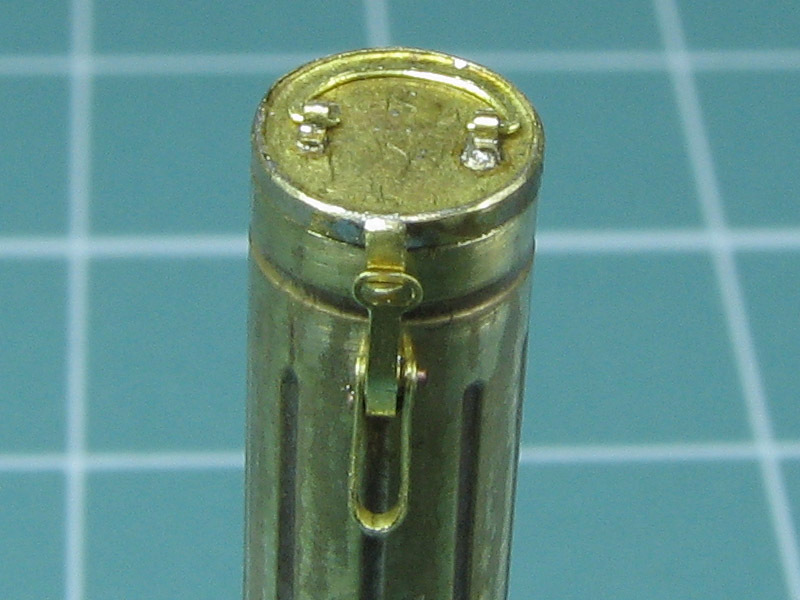 Parts 3C formed like flattened Greek Ω (omega) letter should be fixed into the selected places (squares) on the top of cover (part 3). 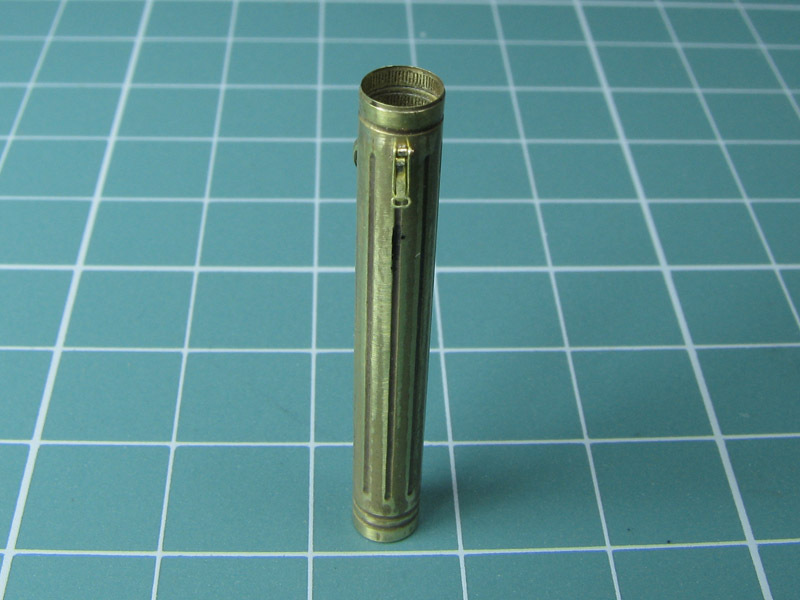 Parts 3C will be hinges for the handle (part 3B) which will be installed at the end of our work. 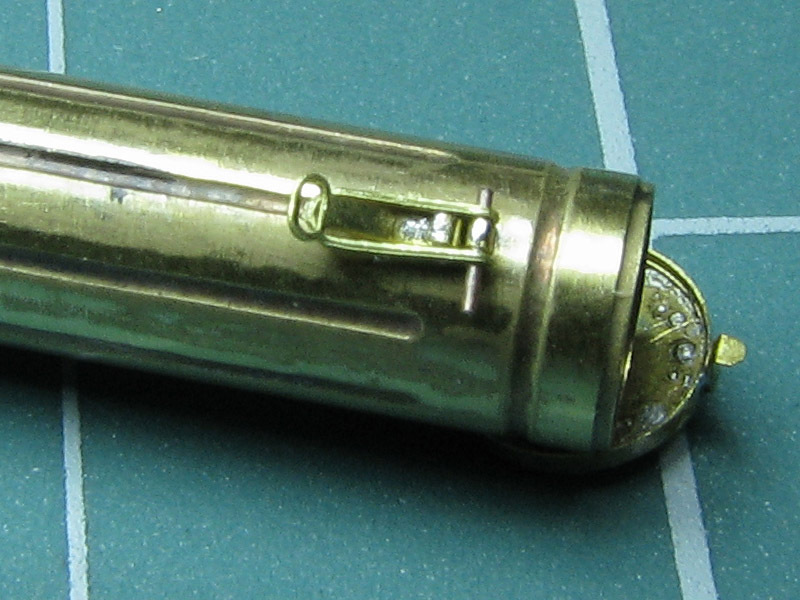 Parts 3 and 3A are complete cover of the tube. 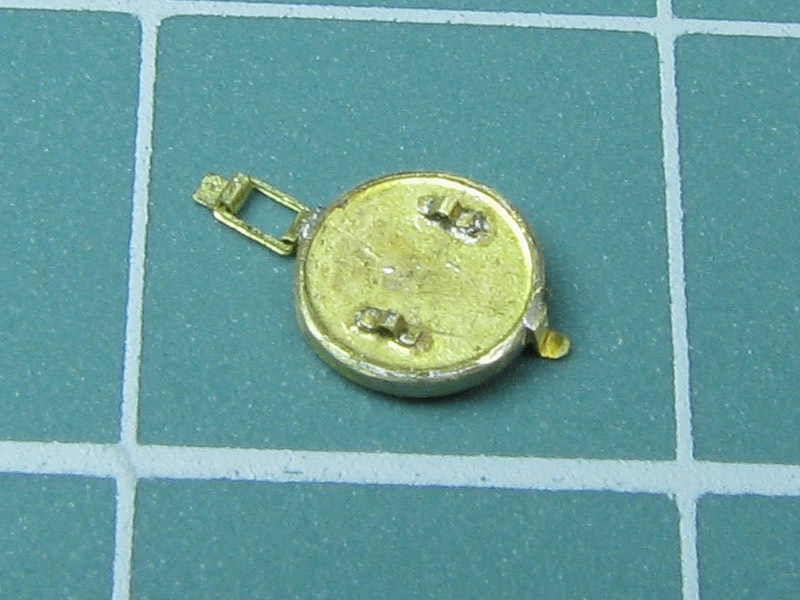 Please remember to check fitting before fixing all parts together. 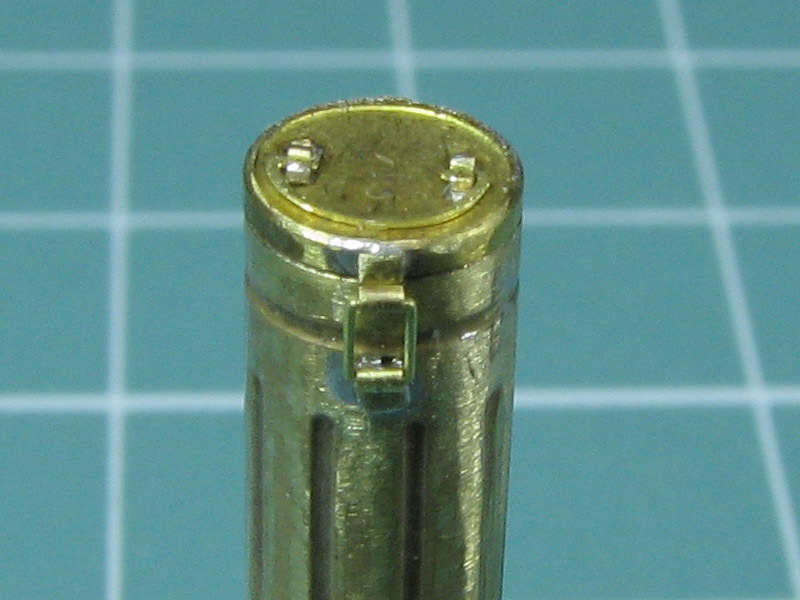 Upper edge, where parts 3 and 3A are joined, should be semicircular. 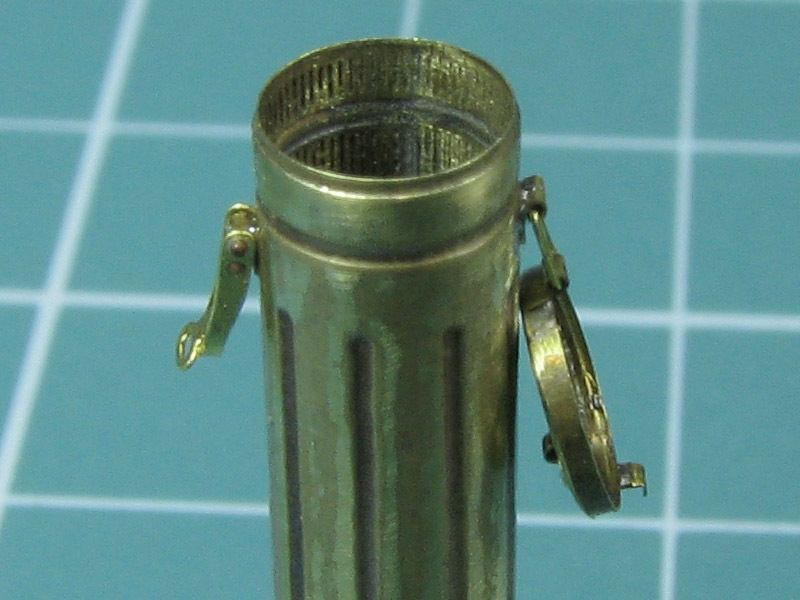 Parts 4 and 4A are hinge joining tube with tube cover. 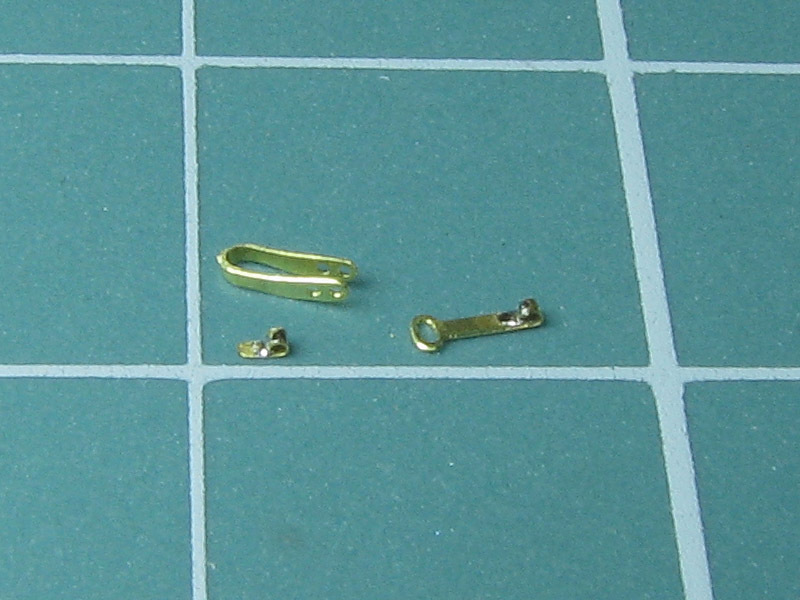 On the opposite site we should attach part 5A — hook. Parts 5, 5B i 6 are hook closure. 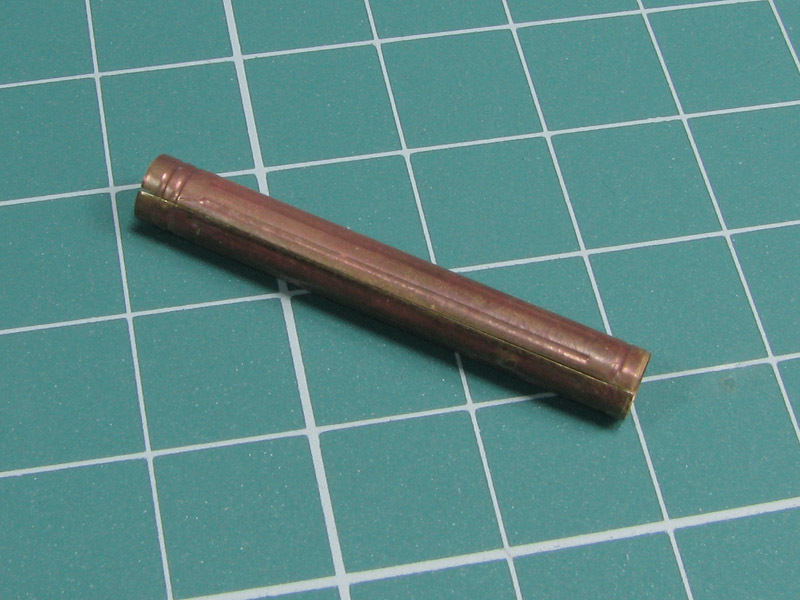 Axle joining all parts should be made from two pieces of copper wire. Completed closure should be movable. Part 3B should be slightly unbended and, after entering endings into the holes formed by 3C parts, should be bended again. 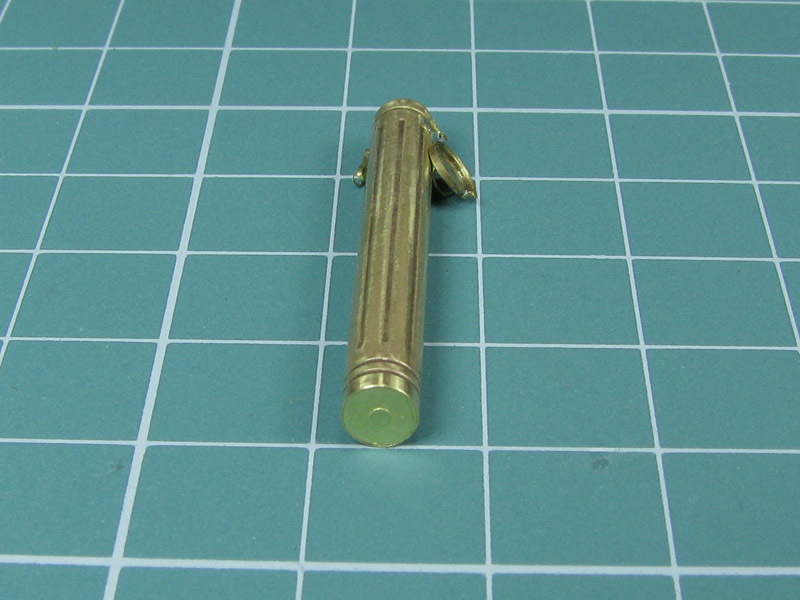 That’s how we’ve made movable handle on the cover of the metal tube. 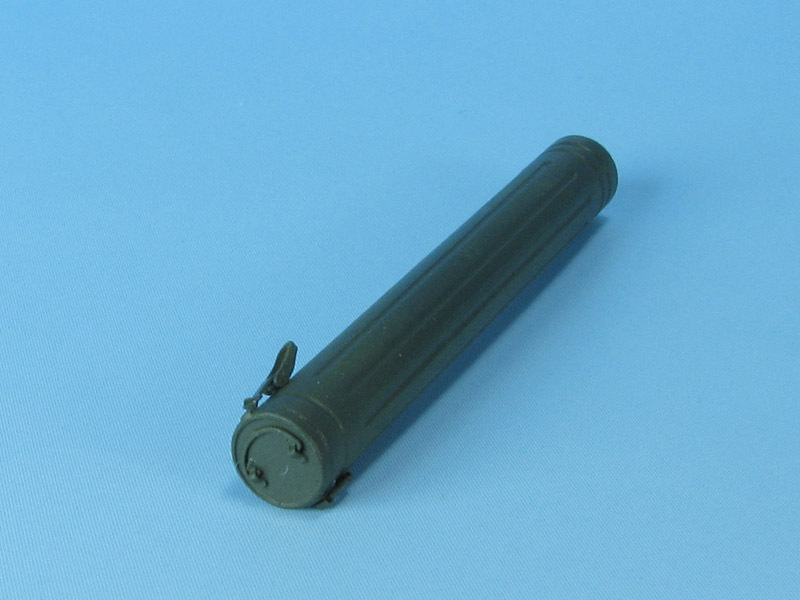 Completed metal box can be used in dioramas in various configurations — closed or opened with or without ammunition inside.